Man caves are the perfect in-home retreat that a guy can call his own. Whether you have a big screen sports room or fully stocked bar complete with a pool table, you are going to need a way to keep cool and comfortable. Enter our list of the coolest man cave ceiling fans. These ceiling fans are uniquely designed, have tons of features and are the perfect finishing touch to turn your unique space into the ultimate man cave. Bring smart home technology to your man cave with these wifi enable ceiling fans. These ceiling fans allow you to control fan speed and lighting with just a smart phone. Hunter offers a ceiling fan for tech-lovers with their Apache smart ceiling fan. Not only can you control this ceiling fan with your smartphone but you can also control it with your voice thanks to Amazon Alexa, Google Assistant and Apple HomeKit compatibility. Anyone looking for a man cave ceiling fan that works seamlessly with state-of-the-art tech will love the Hunter Apache. Control lights and fans with Amazon Alexa, Google Assistant and Apple® HomeKit™ or Hunter’s own Simple Connect app. Those looking for a stylish ceiling fan with smart home capabilities will love the Haiku Home L Series ceiling fan. Not only does Haiku offer the latest in ceiling fan design with perfectly crafted blades and a high grade DC motor but you can control this ceiling fan with you smart phone thanks to the Haiku app. Take your sports themed man cave to the next level with the addition of a sports ceiling fan. The Craftmade Prostar ceiling fan is the fan for basketball themed man caves. Featuring a large basketball motor enclosure and decorative hoop, this ceiling fan pays homage to the court at every detail. This Craftmade Prostar is perfect for game watching home theater rooms or to compliment displayed basketball collectibles. If you are looking for a football themed man cave ceiling fan than Honeywell has you covered. This fan features football field graphics on each blade as well as 3 football shaped lights. With a 48 inch blade span the Honeywell Touchdown football ceiling fan is perfect for medium sized football-themed man caves. Take a break from ordinary decor and install a ceiling fan as unique as your man cave. From vintage-inspired pubs to rustic hunting man caves there is something here for everyone. Fanimation brings us a vintage option for our man cave ceiling fans with their Brewmaster belt-driven fan. This fan is a functional reproduction of the old-school belt-driven fans made by Snediker & Carr in the 1800’s. What’s cool about the Brewmaster is that Fanimation has stayed true to the overall design of the original while making some important modern upgrades. A few such upgrades is replacing high-maintenance leather belts with neoprene belting and upgrading the wood used in the blades. Powered by a fearless direct drive motor that allows for operation of one or two fans. 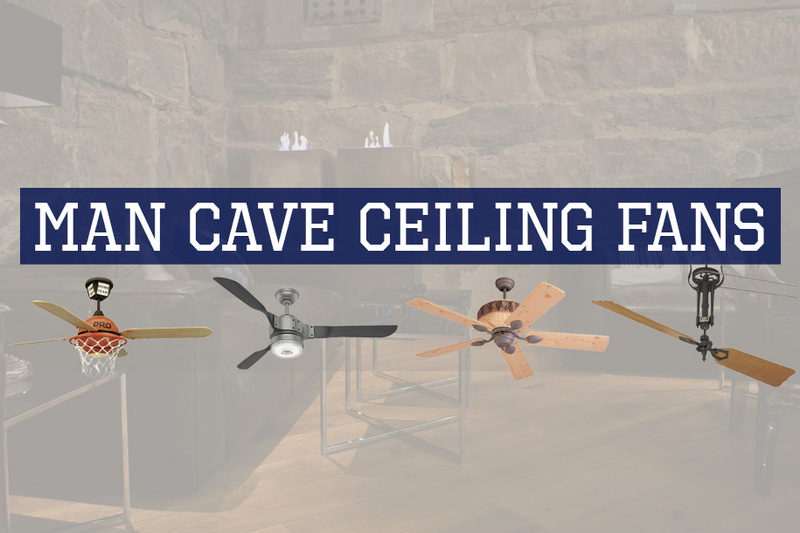 Choose a ceiling fan as rustic as your man cave. Monte Carlo offers the Great Lodge ceiling fan that features weathered iron housing and real lodge pine blades. This ceiling fan includes a ton of unique accents such as a log motor housing and pine cones on the blade hardware. The natural pine fan blades are a great way to accent a workshop or cabin-inspired man cave. Perfect for aviation enthusiasts or for those who want a unique man cave ceiling fan, this Kichler model features two fan blades and black antique pewter accents for an eye-catching look. One of the coolest features of this fan is the airplane-inspired motor enclosure that features exposed bolts and screws. This ceiling fan is as interesting as it is masculine and will be perfect for just about any man cave! Want More ceiling fan ideas for your man cave? If you plan on building a man cave in your garage or workshop than check out our list of best garage ceiling fans where we list our favorite models. Those of you who want to learn more about wifi ceiling fans that can sync with your smart home tech will enjoy our list of best wifi ceiling fans.